River Ridge Landscape Co. is selling full and half cords of wood. These are measured real cords not pick up truck loads, face cords or some other odd measurement. We measure your order in exact cord bins and then deliver to you. We offer Pine, Cottonwood, or mixed cords. All of our wood is cut into 16” lengths and split. 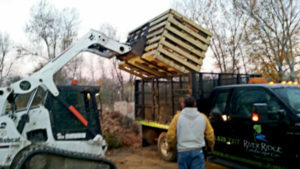 One of our specialties is our bundled firewood. They are a standard .75 cubic foot for easy handling. Our bundles of Montana Pine are shrink wrapped with a fire starter for customer convenience. Prices are for product picked up at our facility in Laurel. Free Delivery to Laurel and Billings for orders over 200 bundles. Delivery costs outside our immediate area are based on volume of order and mileage. River Ridge Landscape Co. Introduces the “River Ridge Campfire Candle.” These all-natural Montana Pine wood candles are great for campfires. 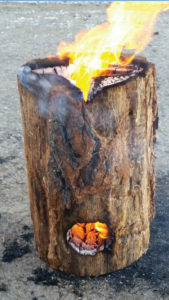 One log burns 1-2 hours, creating an easy-to-start and continually burning campfire. If you hate the hassle of starting a fire and keeping it going, these are for you. 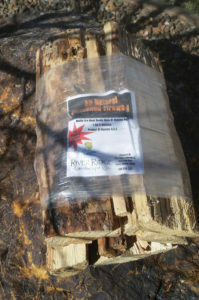 Each log comes with fire starters so they are easy to start. These are always a big hit at outdoor events that allow fires, and private settings where a personal fire with no effort is desired. Prices are for product picked up at our shop. We offer FREE DELIVERY on orders over 50 units in the Billings area. Delivery cost outside of the Billings area is based on volume of order and mileage.